The culinary benefits of cilantro are well known. Every bit is edible, and can be used to flavour your food. The chopped fresh leaves are a tasty addition to stews and curries, added just before serving to preserve their freshness and potency. The ground seeds are a vital ingredient in spice blends including many garam masala, taco and curry powder recipes. Nothing goes to waste, even the cilantro root has many culinary uses! In Thai cooking the root is often used as a base for curry pastes, particularly the famous Thai Green Curry Paste. 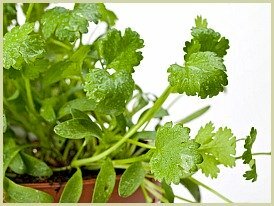 The cilantro plant is actually fairly unusual in that it's both a herb and a spice, the delicate leaves being the herb, and the seeds being the spice. Read more about using them. These are also known as coriander seeds. Incidentally, apart from the US, most other English speaking countries refer to the whole plant, leaves and seeds, as coriander. But it's not just in a culinary sense that you get to appreciate the benefits of cilantro, both the seeds and leaves also have medicinal properties! Add in the fact it's easy to grow and cultivate and you can't really go wrong with this plant. 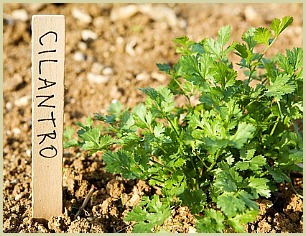 Read step-by-step tips on how to grow cilantro, and have a constant supply all year round. I think that, along with its culinary uses and medicinal and health benefits, it definitely deserves to be called a super herb!